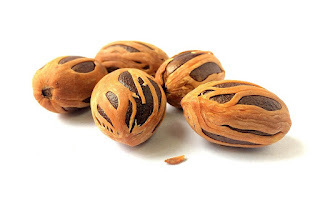 Derived from Nutmeg fruit usually found in Indonesia the Mace/Javitri tastes actually the same. Usually used as a spice in to add the aroma, flavor and nice color to traditional dishes the mace spice is known for its medicinal value too. Omega-3, dietary fibers, folate, Riboflavin, and Thiamin are some nutrients which are present in Mace and makes it a healthy for human consumption. Mace can be stored for a long time if the contact with air, moisture, and light are avoided. Mace/Javitri is a Spice particularly used in preparation of sweet foods. The powdered spice is mainly used in the food processing industry. Mace is used in savoury dishes. Mace is also used in medicines as it has stimulant, carminative, astringent and aphrodisiac properties. Mace is commonly known as Javitri in Hindi, in tamil they call it Jaadipatri, in Telugu they call it Japathri, in Kannada they call it Japatri. We are going to discuss the various benefits of this amazing spice and few things which are necessary for human consumption. If you are dealing with digestive problems like nausea, diarrhea, stomach spasms and gas then mace is the perfect remedy you can try if available. It is suggested to consume it with lukewarm water. If proper capsules are available then it is beneficial in curing diarrhea too. This remedy is mentioned in various Chinese and Indian works of literature which claim the consumption of “Javitri” is beneficial for digestive health. Poor appetite is very common for both young and old and hence to cure it you can add this spice as a common ingredient in daily meals. Mace/ Javitri is know for its medicinal properties will definitely work for your healthy and powerful appetite. According to the survey published in “Asian Pacific Journal of Tropical Medicine” magazine – the mace or nutmeg oil is helpful to for the treatment of cancers. The special compound present in Javitri named as ‘myristicin’ is helpful to hinder the development of colon cancer cells. Massage with Mace oil is very helpful in the treatment muscular and joint pains and sores as it is an excellent sedative. Due to the anti-inflammatory properties which are present in Malice oil, it is highly recommended for curing arthritis, rheumatism, lumbago, etc. It has moderate anti-anxiety as well as sedative qualities. Research has proven the anti-depressant effects on human body. According to the medical experts, it helps with the activation of the neurotransmitters dopamine as well as serotonin which are good for a sound mind. Mace/Javitri spice is also helpful with cold and cough! Consuming Mace in your diet prevents you from the flu and viral disorders and also protect from other diseases. Its medicinal properties make it the best ingredient for in the preparation of cough syrups and cold rubs. It also helps in cure of asthma. Mace/Javitri spice is a real stress buster because it is highly effective for the cure of mental tension and tiredness. Its consumption is helpful for sound memory and also to keep you calm. If you are usually feeling anxious then the Mace is the best remedy. Chinese and Indian traditional medications suggest the use of mace to deal with nervous system illnesses. It contains myristicin as well as elemicin which has the calming effect on the brain and also helps in stimulation. Ayurvedic medicines for tooth pains usually contain Javitri or Mace oil. It also helps for the elimination of foul breath and other oral problems. It is also for healthy gums. Massage oil extracted from mace is best for your health. Regular massage practice using mace oil is helpful for body relaxation and the aroma of it makes your massage session the best event of the day. It contains Copper and Iron which are necessary for the new blood cell formation. Hence it prevents anemia, fatigue, and muscular weakness. If you are facing kidney problems or kidney stones then Mace/Javitri oil is the best medicine. Its regular usage safeguards your kidneys and the kidney stones can be eliminated very easily simply by dissolution. It is best and 100% natural solution for Healthy Kidneys. Mace spice is known for its ability to boost blood circulation in the body, which helps to keep your skin and hair healthy. Better blood circulation also protects you from various diseases and infections. Increased blood circulation also prevents diabetes and other life threatening conditions. Mace/Javitri spice is known for its amazing fragrance and aroma. This spice adds a distinct taste to your dishes and makes them taste exotic. It is also rich in antioxidants, vitamins, minerals and other essential compounds.